Cardinal offers a precision slow-speed in-motion scale, the SWIM series, which utilize Cardinal compression load cells. Cardinal in-motion scales can be found across the US as well as in South America, the Mid East and the Far East. Cardinal’s expertise in the in-motion weighing of vehicles borrows heavily on the knowledge gained in designing and manufacturing one of the best known lines of static vehicle scales. Intercomp Low Speed Weigh-In-Motion (LS-WIM) technology uses hermetically sealed, shear beam load cells which are certified for accuracy and performance by US and European government metrology authorities. 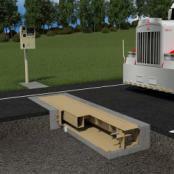 Low-Speed Weigh-In-Motion provides greater precision for applications which include checkweighing and monitoring compliance, issuing citations, or charging by weight. 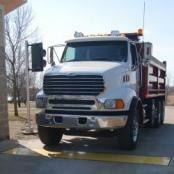 Installation and maintenance is less expensive than standard truck scales.